Don’t let the review by Michiko Kakutani fool you – there are plenty of great reviews of this book out there. It took me awhile to warm to it but at some point the inter-relationships wangled my attention. The book is very dark and very British – there are lots of characters mostly belonging to about a half dozen families. The younger characters were more interesting to me than the older ones. The book opens with Barry Fairbrother, a Pagford Parish councilman, having a fatal heart attack. The repercussions open all sorts of reality to the townspeople, from high (or what passes for high in a small town) to low (and they would be pretty low anywhere). 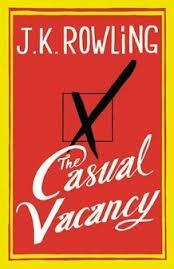 Because the election for the “casual vacancy” opens up the issues which Fairweather stood for are all opened up – and the wars are revealed. It’s rich against poor, children against parents, social agencies against those who would eliminate their services. Husbands against wives. The narrative switches from one set of characters in one set of relationships to another set with a different situations. Once in awhile they are mostly all together – the funeral. Sometimes it’s hard to keep track of it all. The main plot is about who will get the vacant council seat – power plays and viscousness abound. These people really do not like each other at all and it shows. The children are growing up in a very un-loving place and most show evidence of that. The children really dislike their parents – hate them in some cases. At stake in this election is a drug clinic where Terry Wheeden, the mother of Krystal Wheeden, one of the main young characters, gets her methadone – which does NOT keep her off her drugs. The Wheedens live in the housing project, the grandmother, hugely influential on Krystal, lives is in the hospital. In fact, the whole housing project is under scrutiny. Krystal becomes involved with Stuart (Fats) Wall whose parents, Tessa and Colin Wall, are councilor and administrator at the high school. They find out about other kids but not their own. The Mollison’s and Jawanda families are involved with the Council and their children go to school with Krystal, Fats and Gaia. Besides this, Howard Mollison is obese and Dr. Parminder Jawanda from the clinic tries to treat him. And there’s Fats’ best friend, Art, who fancies himself in love with Gaia Bowden, daughter of Kay Bowden who is the love life of Gavin Hughes, a lawyer. But Gavin, who was Barry’s best friend is now falling in love with Barry’s widow, Mary. Meanwhile Kay is in charge of Terry Wheeden’s case at the clinic. Gaia is a good friend of Sukhvinder Jawanda, daughter of the intense, pushy, ambitious Parminder. Sukvinder is also connected to Krystal Wheeden through the school rowing team where Krystal excels. Meanwhile someone has put some very bad things up on the Parish web-site and signed off as “the ghost of Barry Fairweather.” Shirley Mollison, is also a council member and administrator of the site but did she do it? And then Nana Cat Wheelen dies and Krystal wants revenge on to get pregnant to get away from her mother. This is only the beginning of the end. My rating is somewhere between these two – I really enjoyed this book but not quite so well as the Time Magazine reviewer.